At one time, the second (or middle) book of a trilogy was a thing to be dreaded - a book to be endured as a necessary sort of narrative bridge, with the built-in expectation that any lack of enjoyment is to be tempered by anticipation for the concluding book to follow. 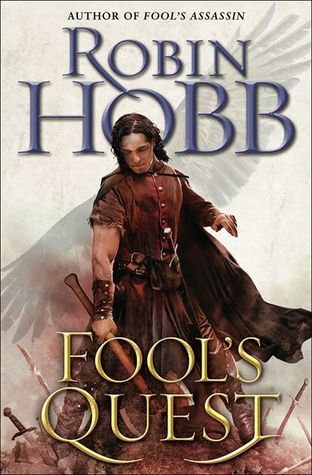 While there have been a few 'new' authors (such as Jeff Salyards and Sebastien de Castell) who have bucked that trend, I really didn't expect the same from an established author like Robin Hobb. After all, her style and her writing are already polished, and she had her growth/development moments almost 20 years and 20 books ago. Whether or not Fool's Assassin was a stumble depends on who you ask, but I had serious issues with the pacing, the characters, and a few of the core plot elements. It was one of my most disappointing reads of last year, and almost soured me on the whole Realms of the Elderlings saga. Hobb had a serious uphill battle for my appreciation going into the second/middle book of this series, and I tempered my expectations accordingly. So, you can imagine my surprise when Fool's Quest not only proved to be a return to form, it even resolved enough aspects of the first book to make me rethink it and adjust my appreciation for it. Fool's Quest is an absolutely brilliant book that works perfectly on all levels. It takes the story that was introduced in the first volume, builds upon it, develops it, and sheds new light on what has gone before. More than that, it's also takes the story that was told in the first two trilogies and develops it in some surprising (but welcome) directions. I won't spoil the moment by providing any sort of context, but if you aren't overcome with emotion when Fitz says "The roar of acclaim broke over me like a wave," then you haven't been paying attention to the sacrifices he's made throughout the series. One of my primary complaints about the first book was that Fitz wasn't himself, and barely resembled the hero I remembered. Hobb tackles that issue head-on here and has Fitz himself acknowledge how far he's strayed under the guise of Tom Badgerlock. It should come as no surprise that he blames himself for the tragedy that struck Withywoods in the first book, and his prolonged period of self-doubt and mourning is just long enough to sweeten the moment when he decides to climb out of his self-pity, take control, and do something about what's happened. He's not quite the nimble assassin of old by the end of this book, but that's okay because he's something better and wiser . . . more patient and more restrained. Similarly, Chade comes very much to resemble his old self here, and the evolution of his relationship with Fitz is a cornerstone of the novel. Early on, he helps Fitz become acclimatized to life back in Buckkeep Castle, even going so far as to give him some spy duties that serve as both an important aspect of the plot and a nice touch of nostalgia for readers. That relationship changes over the course of the story, however, as we come to understand how much Chade has lost and how much life out of the shadows has changed him. Their roles aren't completely reversed by the end, but Fitz definitely does get the opportunity to step up and do his old mentor proud. As for the other cornerstone here, I won't lie when I say that I loved every scene with the Fool. Here is a scarred, broken, damaged man, one who has been robbed of everything from his sense of purpose to his sense of future. He's come to Fitz for help, for protection, and for revenge. He's so terrified and so vulnerable that we get to experience another role relationship reversal between him and Fitz. The Fool grows as he heals, prompted by his own desire for revenge, by a surprising revelation regarding young Bee, and by his experimentation with a dangerous cure. His scenes are emotionally exhausting - as they should be - and he proves to be just as stubborn and obsessed as Fitz or Chade could ever be. As Fitz comments at one point, "You are you. Fool, Lord Golden, Amber, and Beloved. You are you, and we know each other as well as any two people can." Everything they've shared, encountered, and done for one another has weight in this novel, casting shadows and coloring every decision that's made. I complained that the first book felt like an extended prologue of over 500 pages (followed by an opening chapter of about 80), but the story here returns to the pace we're accustomed to with Hobb. That's so say that there are still prolonged long lulls, filled with a lot of talk and a great deal of self-doubt and introspection, but there are also significant moments of action throughout. Things happen here, pushing the story forward, and bringing our characters together. Some of those scenes are small and intimate, while others are more sweeping, but they all work. This is a book that I found myself excited about, from beginning to end, never once lamenting those lulls to build character or reveal the truth behind schemes and actions. It was glorious to properly return to Buckkeep, but I also enjoyed our visits back to Withywoods. More than all that, though, I enjoyed our trips through the Stones the most, especially as they take us to some surprising (and nostalgic) places in the concluding chapters. 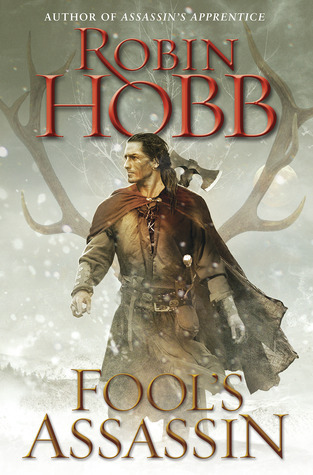 Fool's Quest isn't just a return to form for Fitz, Chade, and the Fool, it's a return to form for Hobb herself. This is precisely the kind of novel we were all expecting from the opening chapter of The Fitz and The Fool Trilogy, and it has me ridiculously anxious to read the next. The pacing is perfect, the characters ring true, and the world building continues in some delightfully surprising ways. There's a lot of intimate, personal conflict here, and I really wondered how she would resolve it all, but the final chapters are some of the most satisfying she's ever written - and that includes the agonizing cliffhanger we've come to expect. Yeah, complete night and day kind of reading experience. I'll gladly forgive her that stumble if the next one is even half as good as this. I'm surprised that so many people regard the first book of the trilogy so badly while I really liked the middle book I absolutely loved and to some extent preferred the first one. The second book is great, for many reasons. But I agree that the first was beautifully rendered. It stands out for "bucking" common conventions and for penetrating the emotional depth of its characters. I so appreciated the pacing and savored the insights into Fitz and Bee's domestic lives. That said, I might agree that a second book similarly paced might not benefit the series. Who knows. So, I appreciate the change of pace in the second book, and can see how the final book could be quite epic in scope, serving as a sort of capstone for the whole Ederlings Saga.